So Emily, dearest birthday girl. You may think Ben has gone to Sicily to see you for a fun visit, but that would be a lie. He has gone to get a photo of you so I can post it here. You see, I have worked for weeks to steal photos from your Facebook account to post a splashy blog on your time in Sicily. Jess, Will, even Ben all gave me tips about transferring your photos to this spot, but when push came to shove, I ended up with misshapen photos. Many of them. To you, it probably seems we have all forgotten about you. This would not be true. It’s just that I continue to reach my technology melting point just about every day. So please know that every day we think of you and send love and TODAY we send special Birthday Love! 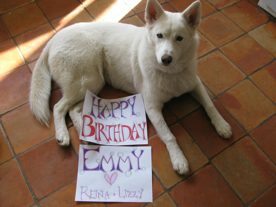 Why, Reina even posed for you with a birthday card. all three dogs were willing to gather round for a rousing rendition of Happy Birthday, provided I gave them treats every few minutes. In truth, the only one of us who refused to join in the North American version of your birthday fiesta was your cat, Mishka. I can only say, I am relieved she had a better attitude when it came to the Animal Wellness Brochure photo shoot. And speaking of which, I am just about to haul your younger brother out of his warm bed to go pick up our first truck load of Animal Wellness brochures. Aren’t you glad you’re in Taormina today? LOVE AND BIRTHDAY CONGRATS DEAR EMILY! In the now on this small farm, Spring has come swiftly, weeks maybe even a month sooner than most years. I have no idea if we will ever again have a March like this one. My mind can’t quite let go of some primal need to sort and sift and consider if there is a climate change pattern at work here, but the rest of me is quite content to just enjoy the wonderful feeling of being out and about in the gardens in a t-shirt when usually I am still garbed in winter gear. I do feel badly for friends who depend on the maple sugaring season as a major part of their farm revenues. The maple sugaring season has been a serious bust, as we have had few of the freezing nights necessary and the days have been so warm that the trees are all but budded out. This budding is unfortunate because it brings on late season strange urine colored sap that doesn’t make for good syrup. With my own small sugaring operation, last year I got fifteen gallons of syrup from thirty one maple taps, while this year I doubt I will get over seven gallons from forty taps. I must say, I happily trade a short sugaring season for the glory of this weather and all the Flowers that have come along so swiftly because of its sudden and steady warmth. Winter Aconite, as cheerful and bright as a midsummer Buttercup, but perhaps more defiant of convention as it blooms in the snow not the midsummer heat. 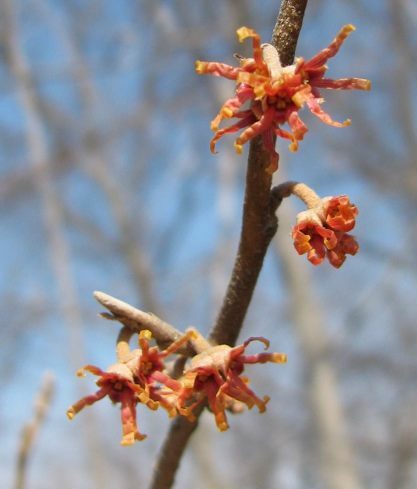 Witch Hazel with its explosion of color. What a potent gem. 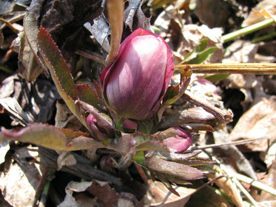 Here a Hellebore begins its slow luxurious unfurling. 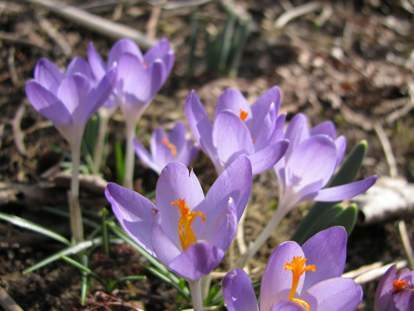 Our old friend Crocus. How happily our surviving honeybees head for its offering of pollen. 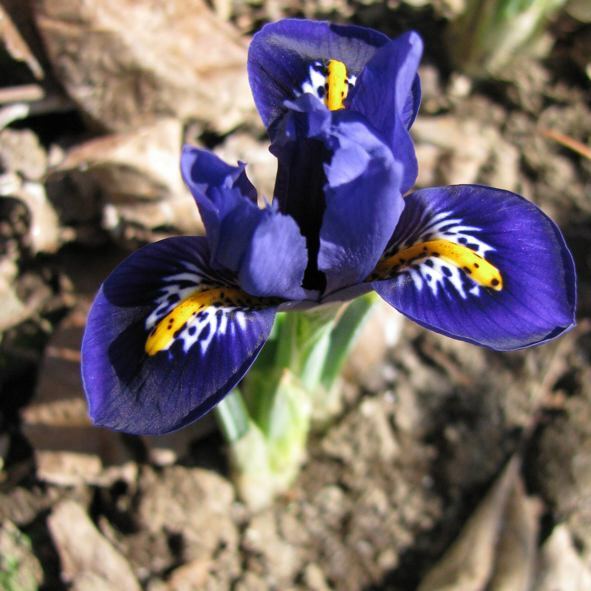 The bold Iris reticulata opened today. I would leave the patch to do some garden chore then moments later I would return to find more blossoms opened as if by fast action photography. 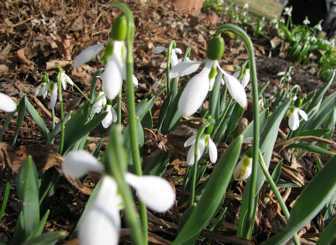 And who could forget noble friend, the Snowdrop. Is there any other early spring Flower that brings more pleasure, arriving as it does when winter holds sway? The Winter Aconite is new in the gardens and this week has just become a Flower Essence for the first time. I need to spend time transcribing its purpose in its own words, but I feel it supports self forgiveness and a swift passage through to new territory when we have faced an old and inharmonious behavioral pattern. owned our role in its perptuation, and desire to begin anew. I was grateful for Winter Aconite’s arrival this week as I was wrestling with my tendency to micromanage one aspect of my childrens’ lives that was clearly none of my business. I felt the Winter Aconite calling to me in the garden and I was glad because I was quite kicking myself as I saw this pattern more clearly than ever. I wanted to let go and move on without the retroactive remorse that can sometimes gum up the works for me, and Winter Aconite promised that this was a piece of its wisdom, helping us to move on when we see the error of our ways without letting us get stuck in, “how could I have behaved this way” sort of remorse. 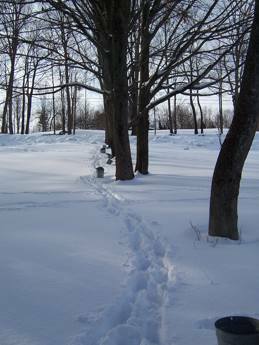 Like its bright yellow Flowers unfurling from frozen earth, it takes us forward swiftly and cheerfully to new terrain. 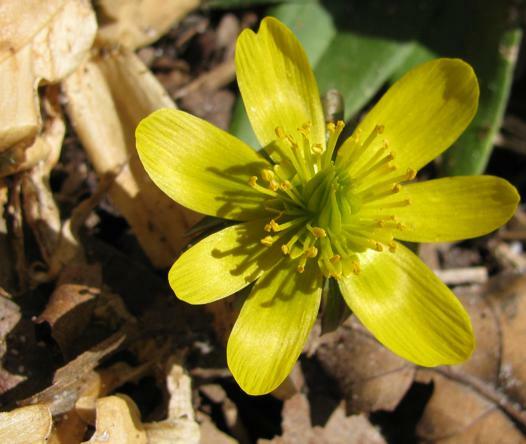 Ben is trying to get me to practice my linking skills on the blog, so here I go with this remark: all of these Flower Essences are available and all but Winter Aconite and Crocus are described for you on our Additional Flower Essence list. (And I will get Jess or Ben to upload a revised link with the definition for Winter Aconite and Crocus soon). The talk of our neighborhood is a visit from this gorgeous bobcat recently. 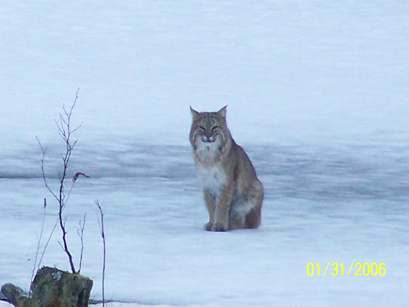 The bobcat sat out on our neighbor’s pond for about twenty minutes enjoying a day of thawing temperatures. It is heartening to know this creature lives amongst us, though I would not be so happy if I was a local woodchuck. Apparently woodchucks are bobcats’ favorite snack. Sometimes I believe I am surfing the wave of technology. Five or ten minutes a week I have this fantasy. The rest of the time the young people here let me down gently. 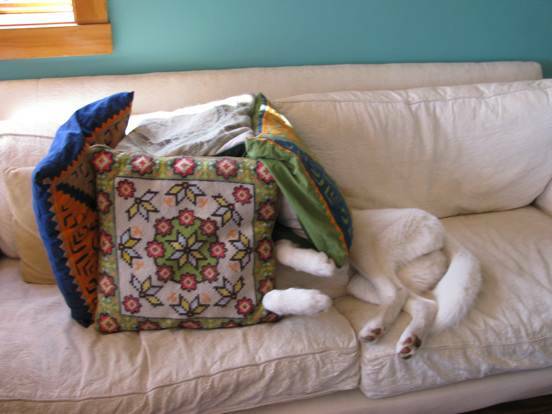 Such was the case this week as I trolled through our wonderful stash of animal photos, both those already decorating the office and those arriving now for our new Animal Wellness Collection brochure. Yes, even I could see that the old photos you sent years ago have faded too much from the sun to be used in the new brochure. Yes, even I could see that there were problems with lots of my early photography efforts, that maybe it was no surprise that an entire box of saved photos contained not a single shot that could be used. The technology sticking points came as your pictures arrived. I loved them all. We got to see so many animal friends we have talked with you about over the years. We were enchanted with each photo update of an old friend and each photo introduction of a new face. AND I wanted them all in the brochure. My dear layout person and technology wizard Jess gently let me down. For a number of days she stayed at her high tech home computer scanning, sizing, transforming each photo sent into a possible shot for the brochure. 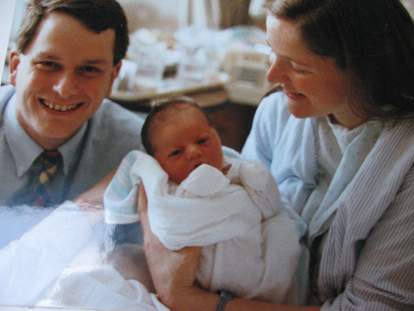 I stayed here, cooing over each new photo arrival. Then Jess came up with her mock ups and gently showed me why not every shot could fit in the brochure. Editing is not my strength. Gentle Jess had her work cut out for her. “Oh come on! What is wrong with this shot?” I would demand. “It’s perfect for Showcats? This is a shy dog in need of that remedy.” I would whine. “But it’s funny.” I would reply. “Well let’s just put it aside for now.” Jess would murmur in soothing tones. And so we got through the sorting and Jess managed to part me from the hundreds of shots I wanted to include in this tiny brochure, but that couldn’t fit. To be frank, Jess had to practice a bit of animal whispering with me. 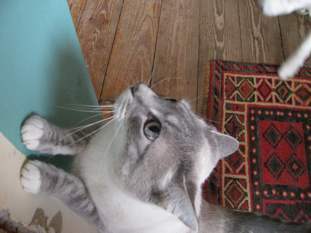 Whenever I got uppity she would settle me down with layout speak about pixels, grain and resolution. Technology talk never fails to bring me back to earth. And the sight of serious technology equipment works even better. At one point, Jess took me to her space station computer to drive home her point, well her five hundred points really. There at the bridge of the USS Enterprise her computer, she moved everything at the speed of light to try all 500 shots I wanted to include. AND I could see what she meant. I faced facts. I have no idea how she does what she does or what most of what she explained to me actually means or even what we were looking at, but I could see she was right. Not all shots could be used. But all this doesn’t mean we haven’t enjoyed every last photo you sent, because we have! Enjoying your animal photo gifts required no technological skills. It was pure and simple old fashion delight. AND I THANK YOU ONE AND ALL! This weekend we began our sugaring season. It is always a bit of a guess when to tap the maple trees. Sometimes we do so midway through February and get an early run of sap if there is a very warm day. Sometimes, like this year when temperatures stayed in the twenties, we wait a bit longer. 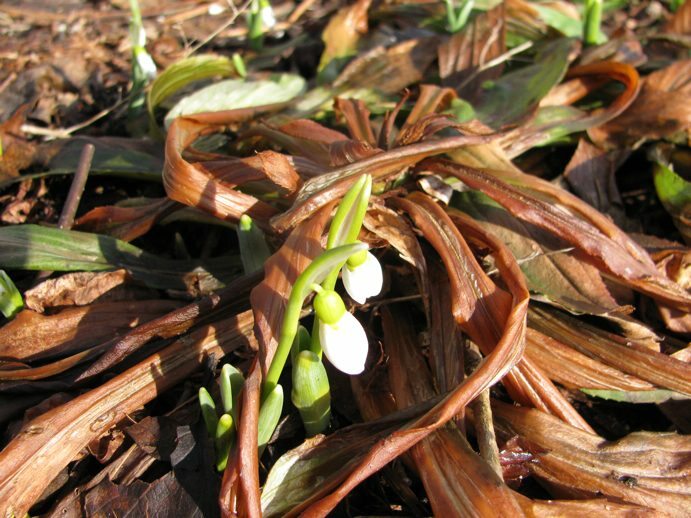 However, we decided it was time to begin no matter what the thermometer was saying when Snowdrops poked their heads up in the shelter of the Arbor Garden. I love how Spring (and Flowers) just won’t be stopped! Besides the usual beloved trees down in the village of Meriden, we tapped a few very old maples at the farm where Elizabeth lives. These maples are in a hedgerow sloping down to a road. 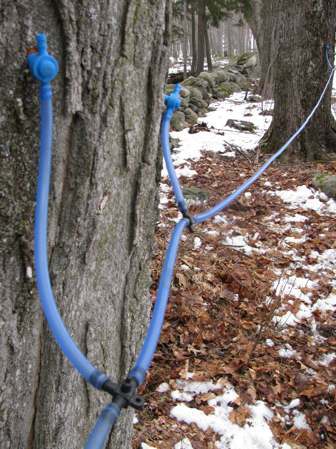 Because we were low on buckets and because of this nice downward slope, we decided to use tubing with all the taps flowing into one line with a big barrel at the bottom of the line collecting the sap. I am used to technology getting way ahead of me in here in the office, but I was surprised when yesterday the maple trees with buckets were flowing so well that a few of the buckets were full while over at our higher tech piped line, there was no sap in the big barrel at the bottom of the line. There is something much more elegant about buckets on a maple tree, but perhaps these trees prefer buckets to piping for other reasons than this aesthetic one. I went over this morning to fiddle and fuss with the line and to generally tune in to the trees. After this visit, I have decided that the issue is not so much a problem with the tubing as a reflection of this new location. It’s too early to know for sure, but I think these new trees are in a colder micro-climate than the ones we tap in town. I sensed they will need a few more days of above ground temperatures before the up and down voyage of their sap begins. Maple trees have their own wisdom and sometimes all it takes is a chill wind blowing across them to make them wait awhile longer. The next few weeks will tell the story and teach me a lot about this new set of maple trees. No matter what amound of sap we get from these trees, I am glad to have a reason to visit this beautiful spot and I am grateful for the owners of the land for their generosity. 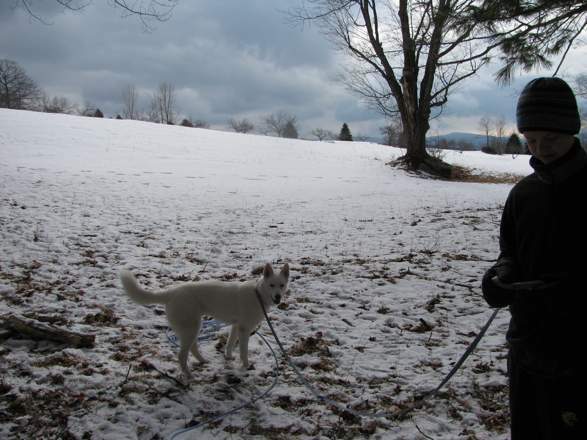 With fifty gallons of sap to boil down today, its time to begin the dance of March wherein I do a little work in the office then run out to stoke the fire then run back in to do a little work and so on and so forth. Sweet boiling sap. 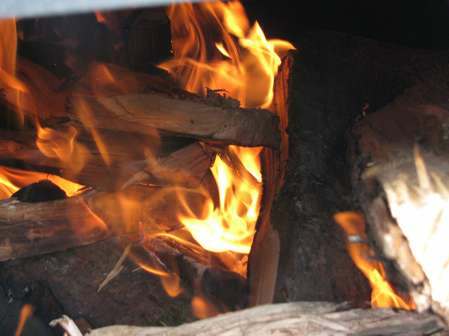 A Roaring Fire. Happiness!